﻿Hog Roast Armagh – Christening Celebration for Triplets! The last christening the Hog Roast Armagh team were involved in had us helping the family officially welcome not just one, but three new bundles of joy into the world! After trying for a baby for a long time, thrilled (and exhausted!) new parents Matt and Debbie were very shocked when they found out that they would be having three all at the same time! Initially daunted, they soon got over their worries when the trio arrived and haven’t looked back since! After their family had multiplied quite rapidly in a very short space of time, the last thing they needed was the added stress of finding a budget-friendly yet high-quality catering company who could provide a special spread that would please even the fussiest members of their family, which is why they were very relived after speaking to Hog Roast Armagh’s customer service team and discovering that we tick all the boxes! For the 70 members of the Christening party, all with varied tastes and dietary requirements, they opted for a classic hog roast served with all the trimmings, along with our superb organic chicken as an alternative meat, served with chipolata stuffing and onion gravy, as well as our homemade quiche and vegetable skewers for the non-meat eaters in the congregation. They also chose seasonal vegetables and rosemary infused roast potatoes as the sides and to give the party an added touch of class, a selection of our delicate hand crafted canapes, including mini pizzas, dim sum and halloumi kebabs. With their perfect menu chosen for the triple christening, Matt and Debbie couldn’t wait to celebrate with their family and friends after the ceremony! As everyone arrived, our friendly front of house team were waiting to greet the guests with our freshly-prepared variety of nibbles and our super-efficient waiting staff made sure everyone was very well taken care of throughout the rest of the meal! Everyone loved Hog Roast Armagh’s varied menu and superb locally-sourced ingredients and the triplets definitely got the christening party they deserved, even if they are still too young to remember it! 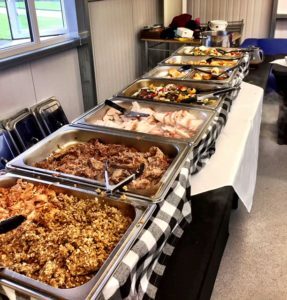 Hog Roast Banbridge – 40th Birthday Party Catering!